Canada Home Prices: Headed for Steep Correction? HomeBusinessCanada Home Prices: Headed for Steep Correction? Home price indexes for January were released this week for the U.S. (Case-Shiller) and Canada (Teranet), see chart above. 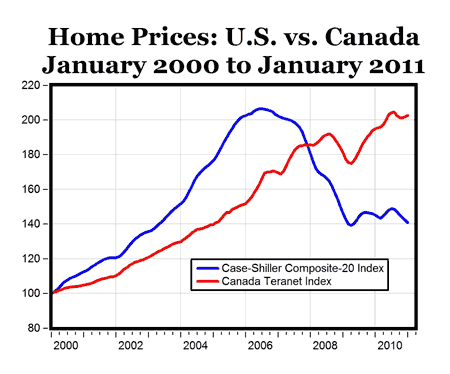 Both home price indexes for both countries equal 100 in January 2000 in the graph. U.S. home prices more than doubled between 2000 and 2006 and peaked at 206.52 in July 2006 when the real estate bubble burst and home prices plunged by 32.4% before hitting bottom in April 2009 at an index level of 139.26. Canadian home prices have more than doubled between 2000 and 2010, and peaked at 204.59 in August 2010, before flattening out over the last six months. “As much of the U.S. housing market limps along, home prices north of the border are on a fresh tear, fired up in part by a borrowing binge that has sent Canadians’ debt to record levels—and now higher than their notoriously profligate U.S. neighbors—while income growth pokes along. All that has raised worry at the country’s central bank, which repeatedly has warned about rising debt levels, and among some economists, who say the market is ripe for a correction—maybe a steep one. Has the Bad Housing Market Reduced Labor Mobility? 1 Comment on Canada Home Prices: Headed for Steep Correction? I’m not sure about this. I mean, we’ve been reading predictions like this for a few months already – yet the market seems stable, people seem to be quite capable of managing their mortgages. Yes, a sizable minority would be challenged by rate rises of less than 1 per cent, but most of these people have fixed-rate mortgages. By the time their mortgages will have to be renewed, they’re financial capacity will be increased by time and the amount of mortgage debt being financed will be reduced. Correction on the way? Probably, but maybe not so steep.